If you’ve seen Coppola’s Bram Stoker’s Dracula you’ll be familiar with the opening few minutes where they explain the history of Dracula as Vlad the Impaler and the fate of his loving wife. Those few minutes are dragged out into a full length film in Dracula Untold but with cheesy, unnecessary special effects and some bland characters. The film starts with narration, we learn that as a child Vlad was taken as a hostage by the Turkish empire and trained to be a soldier. We then see the dark and brooding Vlad as an adult, once feared on the battlefield but due to the somewhat uneasy peace with the Turkish his prowess is in question. One day Vlad and a couple of his men find a damaged Turkish helmet in a river and are concerned there are Turkish soldiers in Transylvanian territory. They follow the stream and end up at a cave where they are attacked by a vampire, his men dead; Vlad manages to get away. The next day is Easter and Vlad and his wife host a feast only for the celebrations to be cut short when a group of Turkish soldiers arrive to demand 1,000 boys for the Turkish Army including Vlad’s own son. If he refuses Transylvania will be at war with The Turkish, lead by Mehmed (Dominic Cooper), the son of the man who kept Vlad as a prisoner as a child. Vlad initially refuses, then accepts this is the only way to avoid a war, one they cannot win as they don’t have the manpower to take on the Turkish. At the last minute Vlad changes his mind and and defies Mehmen by refusing to deliver his son. Fearing the coming war Vlad finds himself seeking out the monster in the cave. As he belives men don’t fear men, they fear monsters. 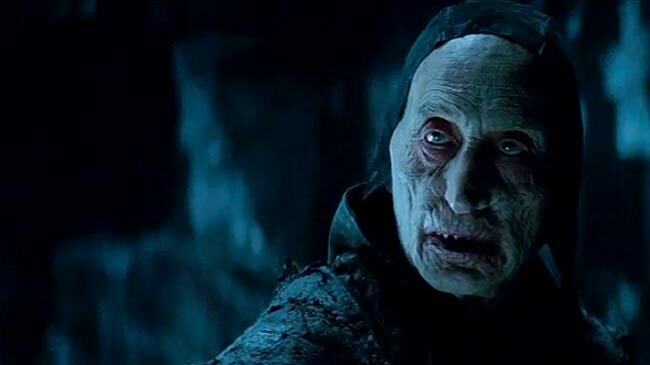 Enter Charles Dance, the Master Vampire and he offers Vlad a 3 days or your money back style offer. If he can survive 3 days of being a vampire without drinking blood he can revert back to human but if does give in to the insatiable lust for blood then he’ll remain a vampire for all time. Vlad is convinced that with vampire powers, the strength of 100 men etc,he can win this war with the Turkish in 3 days so he agrees, drinks some of Charlie’s blood and then the fun begins. Or it should. I found the heat seeking vampire vision tedious and while turning into a colony of bats during fight scenes looked fairly impressive, it was overused and too often just looks like a grey swirl of dust than bats. If I’m honest I feel like this isn’t really a film at all but a vehicle for a franchise as set up by the last scene of the film. You can smell the executives on this film. It stretches what took Coppola a few minutes to achieve into an hour and a half. The inconsistencies of his vampirism is a little annoying too. At times the sunlight burns his flesh instantly in others he seems to be walking around in daylight with no problems whatsoever. 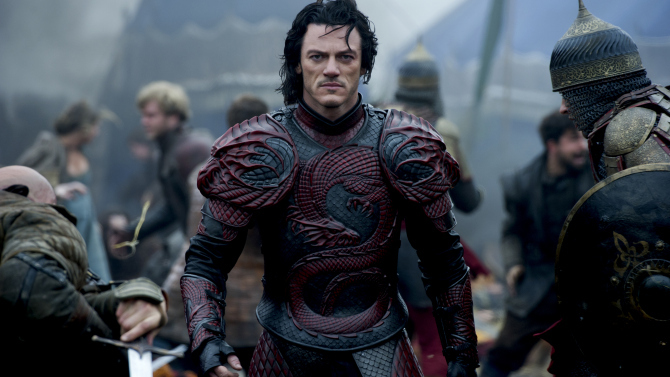 Luke Evans is fine in the role of Vlad, he does a good job all things considered but there’s something missing from his performance. Was he enough of a monster as a vampire? The insatiable need for blood is really only brought up twice and he’s not exactly tortured by it, more of a mild annoyance, in fact it seems remarkably easy to not drink blood. His incredibly bland but beautiful wife is played by Sarah Gadon (who I enjoyed in Enemy and Maps to the Stars). Her entire character is that of a wispy doting wife, she stands by her man but other than a lot of fawning over her husband there’s not much to the character and considering love is such an important part of the Dracula lore I didn’t buy that their love would transcend the ages. Dracula Untold isn’t the dark romantic tale we all know and love. I want to call it Dracula Begins because I couldn’t help but make the comparison to Batman Begins, in as much as it was an origin story that bored me to tears. It’s more concerned with the war than it is about the main character, the whole reason for watching right? Not one I’d watch again. This entry was posted in Film and tagged Bram Stoker, Dracula, Dracula Untold, horror, Legendary Pictures, Luke Evans, origin, review, Universal Pictures, vampire. Bookmark the permalink.